Company: Vijaya Laghubitta Bittiya Sanstha Ltd.
Qualification: 10+2 or equivalent with 2 years experience. – An application with vacancy/advertisement number, location and application’s signature. – Attachments should not exceed 5MB in size. Vijaya Laghubitta Bittiya Sanstha Ltd.
Job Categories: 10+2 / Bachelors. Job Types: Full-Time. 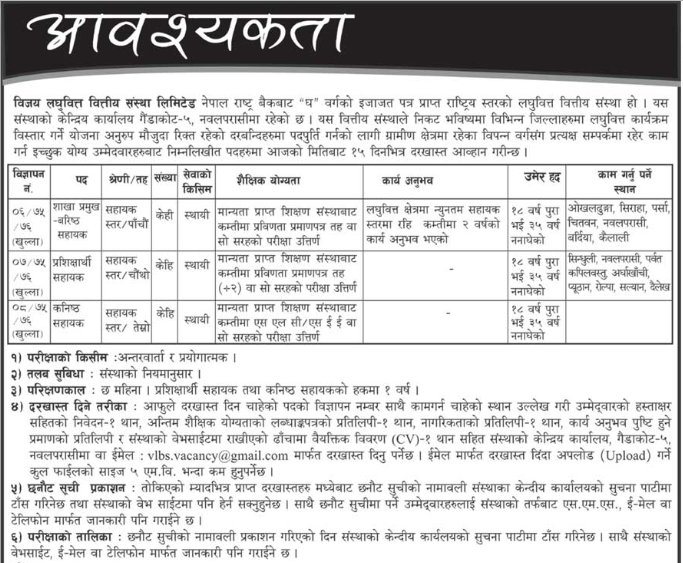 Job Tags: EJOBS, Ejobs Nepal, ejobsnepal, HAMRO JOB, jagire, job vacancy, Job Vacancy For Junior Assistant, JOB VACANCY FOR VARIOUS POSITION, Job Vacancy In Vijaya Laghubitta Bittiya Sanstha Ltd, Jobs in Kathmandu, jobs in nepal, mero job, mero rojgari, Merorojgari, Nepal, Nepali Jobs, nepalijobs, timro job, and wanted. Salaries: Negotiable.